At Allen Business Machines, we specialize in keeping your business in business. After helping clients for more than 60 years, we’ve seen the importance of keeping systems functional and up-to-date. Aging and outdated computers can lead to a significant loss of productivity for your business. Of course, it can take a lot of time and money to update your systems. Most SMBs don’t have a technology roadmap or a qualified professional available to determine the most productive and cost-effective solutions. ABM’s expert staff can serve as an advisor for your IT needs. As part of our IT Roadmap and Planning solution, we can help you build a strategy for maintaining and upgrading your network. The average SMB spends 6.4% of its revenue on acquiring technology. However, 80% of their total cost of ownership comes after the initial purchase. That’s why ABM helps you plan out a long-range roadmap for your IT network. We can enable you to enhance your workflows and achieve your business goals by leveraging your office’s systems. ABM assigns you a Virtual Chief Information Officer (VCIO) who understands how your IT plan meets your business needs. You can go to your VCIO for support, advice and proactive management. Also, our VCIOs stay up-to-date on rules for keeping sensitive records secure. We can help you meet compliance for HIPAA, Sarbanes-Oxley and other federal regulations as well as state and local standards. HaaS ensures your operational efficiency by establishing a timeframe for upgrading your systems. This integrates with your IT roadmap to keep you operating at optimal levels. 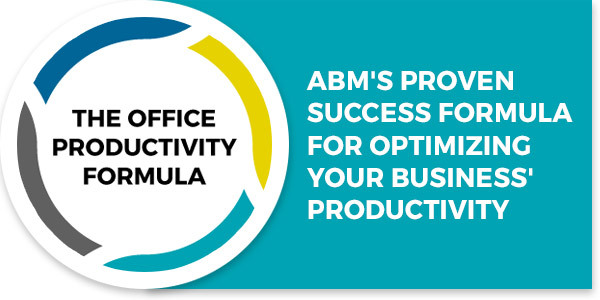 ABM provides you with regular reports on your network’s overall health. You’ll stay informed of potential problems or vulnerabilities as well as the most effective response options. We’ll also scan your servers and PCs on a weekly basis to preserve your hardware, software and OS settings. Questions? Ready to get started? CONTACT US. What is an Office Chair Forward Tilt Mechanism? Does Your Company Need Web Filtering? How do I find my meter read? Allen Business Machines specializes in keeping your business in business. For more than 60 years, we’ve offered clients everything they need to work day in and day out. From printing systems and IT services to furniture and supplies, we’re proud to be your complete office solution. Since 1953, ABM has provided superior products and services to clients in Fort Wayne, Indiana and surrounding areas. We have been recognized by the Pros Elite Group as one of the 100 best servicing dealers in the United States.